Elizabeth Wyman | The Journal Gazette Senior Kason Harrell is averaging 16.8 points and hitting 44.6 percent from 3-point range for the Mastodons. Kason Harrell played 72 minutes his freshmen season at Purdue Fort Wayne. He played maybe 30 seconds a game if he was lucky. Coming out of high school where he averaged 25 points and 32 minutes a game, it was a learning curve for the Pittsburgh native. But Harrell wants to thank coach Jon Coffman for teaching him to trust the process and fight for what you want. “If he wouldn't have done that I wouldn't have had that chip on my shoulder to come out here and work like crazy,” Harrell said. This season, the 6-foot-2 senior guard is averaging 16.8 points, 30.5 minutes and ranks fifth in the Summit League in 3-point percentage (.446) while helping the Mastodons (11-7, 3-0 Summit League) zoom to the top of the conference with a five-game winning streak. Harrell decided not to redshirt his freshman year, which even now he regrets. “I was just like 'it is what is.' I didn't redshirt and I may not play tonight, but maybe I'll play next game, so I've got to be ready,” Harrell said. It's hard to keep players in Harrell's situation motivated. Coffman couldn't tell with Harrell, though. “When you have a guy on your bench who's your hardest worker and not making any issues over playing time, just saying 'hey, I've got to get better every day,' that makes for a successful team,” Coffman said. Harrell is now reaping the rewards of his hard work. Harrell averaged 13.5 points last season but heavily relied on former Mastodons Mo Evans and Bryson Scott to get him open looks. “It's really been helping because teams have been guarding me as a shooter and I'm able to use that to my advantage and am able to get into the paint and catch them off guard a little bit,” Harrell said. He's become adept at creating his own shot, getting to the rim and going to the foul line. He had 46 free throw attempts last season. He's taken 53 this season already. He joined the Purdue Fort Wayne 1,000-point club on a first-half free throw in a 68-65 win over Akron on Dec. 5. “When I was a freshmen I didn't think I would ever get to that point and just to know all the hard work and trust in God really paid off for me,” Harrell said. He has also been a part of some memorable Mastodons moments. He hit arguably the biggest shot of his career in the Mastodons' 2016 matchup with No. 3 Indiana. 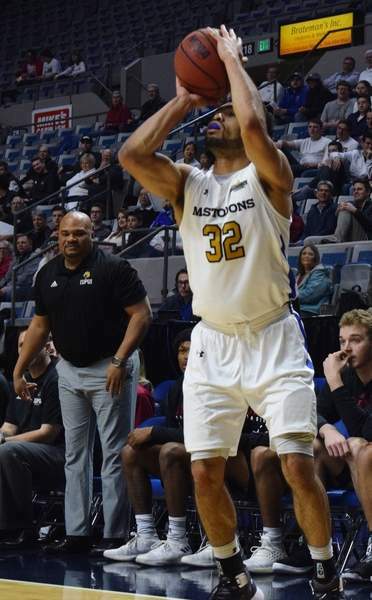 His basket at the beginning of overtime put the Mastodons up by three en route to the biggest upset in school history. Harrell said Coffman brought him aside during a timeout and told him he would hit a big shot that game – despite hitting only 2 of 9 from 3 to that point. The following year he put up a career-high 28 points in the Mastodons' 92-72 drubbing of Indiana at Assembly Hall. Harrell won't get cocky. He's a serious, hard-working, faith-based man who even surprises himself sometimes by what he's accomplished since his freshmen season.